As I am a new member here I like to show you all something cool. 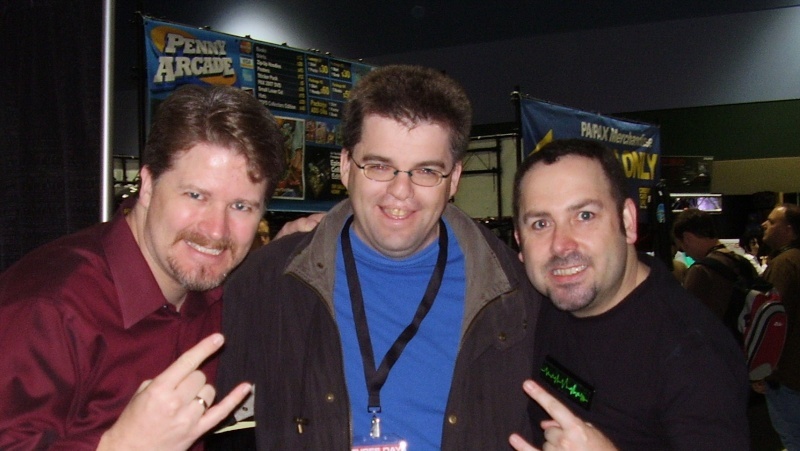 On the weekend of Aug 29 to Aug 31 I went to the Pax and I got to meet Jeff Hickman and Paul Barnett. I thought they where really cool and I got to take a picture with them. Just to make you a little envious I will post the picture. Sorry, my spanish is weak, after 4 years of spanish class. I see no pic wtf! Hold on having trouble getting the picture up. OMG... the Picture is a lie? Tis not a lie. I have seen it. I was almost blinded by his uglieness. But it does exist! LOL don't you know before viewing pictures on the internet you are supposed to put on your rose-colored glasses!?! For your protection of course! That's pretty cool you got to meet them. I'd love to see Paul in person during one of those he cracks me up! Yes, now I can photoshop myself in there so I can pretend I had a pic with them.